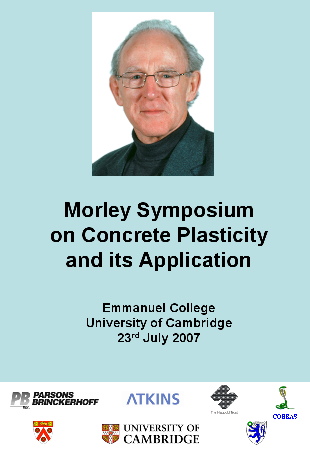 On 23rd July 2007 a Symposium was held at Emmanuel College Cambridge on the theme of Concrete Plasticity and its application. It was held to mark the retirement later this year of Chris Morley. The attendees at the symposium wished to acknowledge his tremendous contributions to the study of plasticity in concrete. The first major conference on the subject was held at the Technical University of Denmark in Lyngby, Copenhagen in 1979, under the auspices of IABSE and the chairmanship of Prof Bruno Thurlimann. Since then, the principles of plasticity have been incorporated into the design procedures for most concrete structures, although the link is not always made explicit. Virtually all designs for flexure, all code rules for shear, and all analyses of slabs, both for punching shear and bending, rely on the fact that the Safe Load Theorem applies to concrete structures. Major problems are now being caused because the current generation of young engineers believe the results of their nonlinear finite element analyses. It would be interesting to know whether any of them could actually quote the lower bound theorem; they would probably be horrified to compare the actual stresses in their structures with the values they have assumed. Many of the paper will also appear in a special issue of the Magazine of Concrete Research, to be published early in 2008. The organisers would like to thank Parsons Brinckerhoff, Atkins, The Happold Trust, Cobras, Trinity College, and Emmanuel College for contributing to the costs of holding the symposium and publishing the proceedings. Copies of the proceedings can be purchased from Nami Norman <nn231@eng.cam.ac.uk>, Dept of Engineering, University of Cambridge, price £10 including post and packing. Peter Lowe University of Sydney Where to from here? Why isn't the Morley sandwich approach to slab reinforcement used every time?